Preheat oven to 375F You will need 12 ovenproof cups that can hold 1 1/4 cups of liquid to bake the cakes in. Cut parchment paper in circles that will fit 3/4 way up the inside of the cup. Wash and dry the rhubarb, then cut into ¼ inch pieces. Wash oranges, grate and mix in with the chopped almonds. Rough chop the almond paste and mix together with the soft butter in the bowl of a stand or hand mixer. Add1 pinch of salt and ¾ cups of the sugar to the bowl, and cream for 10 minutes using a paddle. In a seperate bowl, add the remaining ¼ cup of sugar to the rhubarb and mix well. Set aside. Add 1 egg at a time to the butter and marzipan mixture, blending in each one for about 30 seconds. Mix the flour, corn starch and baking powder together, sift and quickly mix into the cream. With a spatula fold in the almonds and rhubarb. Fill cups about ¾ ways up and bake on a baking sheet for about 20 minutes. (A pastry bag without a tip attached works well). Let cool in the cups. 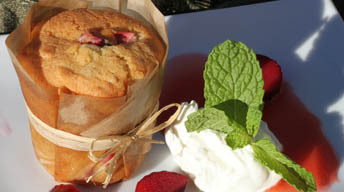 Serve cakes out of the cups with parchment paper still attached and a ribbon tied around or carefully remove parchment.